We offer buffet, butler passed and plated service. Decorative disposables included (plates, forks, napkins and cups), Service Cleanup and Setup, Three (3) hour reception. Note: glassware and flatware extra. Menu selection includes (1) Meat Entrée, (2) Side Items, Assorted Dinner Rolls, Salad and Beverage. Note: add $2. per person for an additional meat entrée. Special menu request can be accommodated. Please contact us for for rates. Penne, Bow-tie, Rotini, and Tortellini served with 2 sauces: Marinara, Alfredo, Pesto, Sun-dried Tomato with Roasted Garlic, Marinara Vodka Cream. 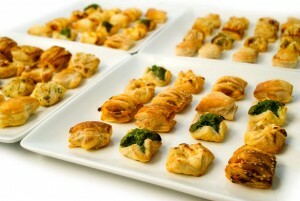 Ladyfingers Catering Company will take your event beyond the ordinary. Our goal is to provide a one of a kind experience that will wow your guests and have them talking about your event long after it’s over!